Holdfast Tunisia is a block war game that allows players to refight the World War II desert campaign that saw the American army enter the war in Europe. The German, Italian, American, and British army are all present as well as national sub-units within each. The Axis and Allies each receive 30 blocks with labels as they use Resource Points to perform actions with their units such as movement and combat. Each turn players will add replacements to units on the board using Resource Points. They will also use the Resource points to move and attack with units in any order. This allows players to exploit breakthroughs, and makes planning important to prevent enemy breakthroughs. As the Allies can you trap the German and Italian armies before reinforcements appear from Italy? As the Axis forces can you bring in reinforcements from Italy and destroy the Allies piece meal? History: Rommel and the Afrika Korps is on the run. Montgomery and the British Eighth army is pursuing him doggedly, trying not to give him time to regroup. Russia is hanging on against Hitler’s armies on the Eastfront. Now is the time. Operation Torch is set to begin to try to trap Rommel and the Afrika Korp, and prevent German reinforcements from being sent to Russia. The Americans are about to enter the game in Europe. Landing in Morocco and Tunisia, Eisenhower is set to turn Patton loose in the desert as the American army will get it’s first taste of war. A bitter taste it will be. The Germans and Italians will feed in reinforcements as they try to defeat the combined American and British armies. 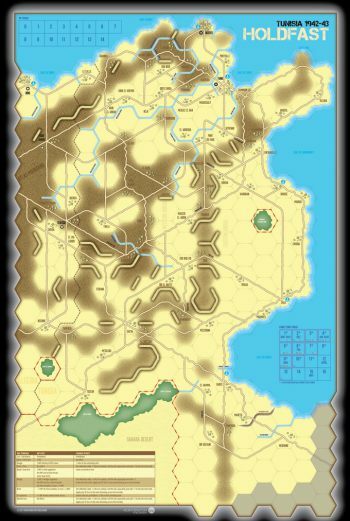 Holdfast Tunisia, designed by veteran gamer Matt Looby is Volume VI in our World War II series. Matt is working on the rest of the Mediterranean Theater with upcoming games on Sicily and Italy.